Most people do not seem to realise that when it comes to hard drive failures it’s not a case of if, it’s a case of when. Are you one of those people that have hundreds of personal photo’s on your computer? Is that the only copy you have? 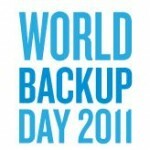 If so maybe it is time to start making backups. Copy files onto an external harddrive or USB drive. This is fast and all you need to do is plug the drive into your machine and drag files onto it. If you are a Mac user like me then you will be familiar with Apple’s Time Machine software, this is my preferred backup tool on my laptop as it makes backup and restoring data very easy. Burn files onto CD, DVD or BluRay. This is the cheapest way to backup your data. Of course that is if you have a CD / DVD / BluRay burner. You cannot store as much data on discs as you can on harddrives, but once written, if you store them in a safe place, they tend to be a lot more durable then most. Upload files onto the cloud. The number of online solutions is growing all the time. Two of the better ones, in my opinion, are Dropbox and apple’s iDisk which is part of Apple’s mobileme system.